Globally, the media and publishing industry presents umpteen opportunities for printing equipment manufacturers, ink and paper suppliers and manufacturers, publishers and more. Aware of the challenges that marketers face in this sector while carving a niche for themselves, Blue Mail Media provides highly accurate and reliable Media and Publishing Industry List that connects you with the top decision makers in the industry who you can approach to promote your offerings or initiate a sales drive. Blue Mail Media has a strong data partners network that enables us to serve clients in all major regions such as Africa, ASIA, Australia, Europe, North America, New Zealand, Middle East and South America. 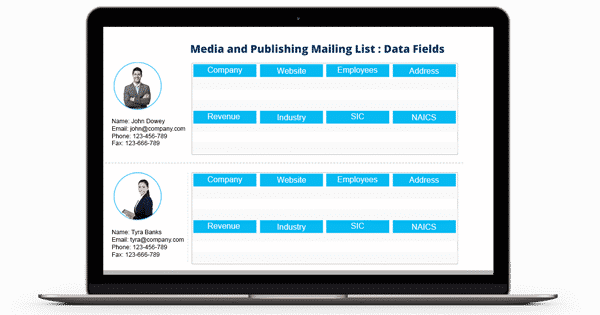 Our Media and Publishing Industry Executives Database allows you to connect with your target prospects via telephone, email or mail. As our data goes through stringent quality checks, your chances of achieving a greater response rates and conversions go up. Our team of data scientists, experts and professionals leave no stone unturned to make sure that our data meets the highest quality standards and help you achieve greatest success in your marketing initiatives. Knowing that you may have different marketing requirements than most others, we offer pre-packaged as well as customized Media and Publishing Industry Email List that aligns perfectly with your marketing objectives.